Celebrating the last night of 2018 and the dawning of 2019 in Niagara Falls gives you numerous possibilities. Illuminated falls. Winter Festival of Lights. Free party in Queen Victoria Park. Fireworks above the flowing water. These are just some of the exciting events occurring on Dec. 31. Niagara Falls Hotels make this annual occasion even more special. Pick your favorite activities and lodgings below. Illuminated Falls: 4:30 p.m.-2 a.m.
Three Niagara Gorge locations emit hundreds of programmable LED lights to create nightly waterfall illuminations. You can view the glowing colors that paint stunning vistas from many spots including your Fallsview guest room. Tinted cascades stand out from a dark sky, elevating this natural wonder’s mesmerizing beauty. Tour the nearly 5-mile route traveling through beautiful Niagara Parks, scenic Dufferin Islands, and other popular tourist districts. More than 2 million colorful lights create various Winter Festival of Lights illuminated displays. Glittering sights include 3-D angels, Canadian-American flag, Zimmerman Fountain, 15 3-D Canadian wildlife (bison, deer, and moose), Noah’s Ark, soaring Skylon Tower, Power Generating Station’s light show, over 50 light-wrapped trees and laser light shows. Join the million-plus international visitors who enjoy this treasured 89-day holiday spectacle each season. This year’s full dates are Nov. 3-Jan. 31, 2019. Rather than charging admission fees, Festival Ambassadors accept donations at the Dufferin Islands exit. Suggested contributions are $5-$10 for cars and $1 for coach bus passengers. Proceeds enhance future lighted displays. Dress warmly for the free outdoor party that will welcome 60,000 expected revelers. The all-Canadian lineup will feature live entertainment and music with assorted eats and drinks. End the evening at this major Queen Victoria Park event by watching the dazzling midnight fireworks show. It launches from Skylon Tower, Niagara Gorge, and over the majestic falls. To view illuminations and fireworks from three Skylon Tower locations, ride an exterior glass elevator up to a height of 775 feet above Niagara Falls. The Revolving Dining Room serves continental cuisine with 4:30-10 p.m. dinner seatings. Summit Suite Buffet offers a tempting selection 5-10 p.m. If you just want a great vantage point, visit the outdoor or indoor observation deck 5-10 p.m. for dramatic 360-degree city and waterfall views. 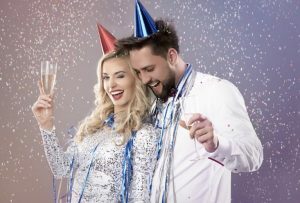 Sheraton on the Falls: Booking your room at this popular hotel for New Year’s Eve Niagara Falls lets you choose from two dinner options. The Fallsview Buffet combines a delectable variety with an illuminated waterfall backdrop. Upgrade your Sheraton on the Falls package with an early family meal. To feast while watching fireworks, select the later seating. It features wine, DJ music, dancing, and midnight toast. You can dine and bring in the New Year at the same location. Crowne Plaza: This classy haven adds two three-course dinner seatings to your lavish guest room. Savor Massimo Capra’s contemporary Italian specialties early or late at the hotel’s fabulous Rainbow Room. The Crowne Plaza’s Fallsview setting ensures amazing illumination and fireworks sightings. 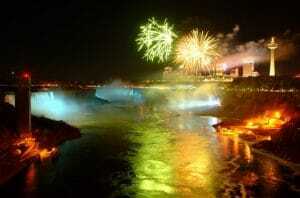 Marriott on the Falls: To join a rousing New Year’s Eve party Niagara Falls, stay at the Marriott on the Falls. Your package includes a deluxe room, dinner in Milestones on the Falls, hotel Greatroom party (DJ music, dancing, and midnight toast), and breakfast buffet. Marriott Fallsview: Choose the property closest to the falls to enjoy the enchanting winter scenery. The Marriott Fallsview package features deluxe accommodations, dinner at the on-site Morton’s Grille Steakhouse, hotel Greatroom party, and buffet breakfast. The Niagara Falls area is home to many eateries specializing in international flavors. Top recommendations include Casa Mia Ristorante, Copacabana Brazilian Steakhouse, and Koutouki Greek Cuisine. Young adults may want to party at bars or nightclubs like Blush Ultra Lounge, Club Se7en, and Dragonfly Nightclub. Stop into Casino Niagara or Fallsview Casino Resort for 24-hour gaming excitement. Wherever you stay and celebrate in Canadian Niagara Falls, this New Year’s Eve will be memorable.